Create your career profile | Visit barry.joinhandshake.com/login. Chip Hiden and Alexis Irvin, two recent college graduates, quit their jobs to take a road trip across America — meeting and interviewing professionals who discovered their calling. Along the way, they learned about topics such as: discovering one’s passion, committing to a dream, dealing with setbacks and redefining success for the Millennial generation. “The Dream Share Project” is a documentary film featuring their trip and interviews with successful people, including an Olympic skier, one of the original Latin Kings of Comedy, a slam poet, a “Project Runway” fashion designer, the CEO of a sustainable flip-flop company, and more. 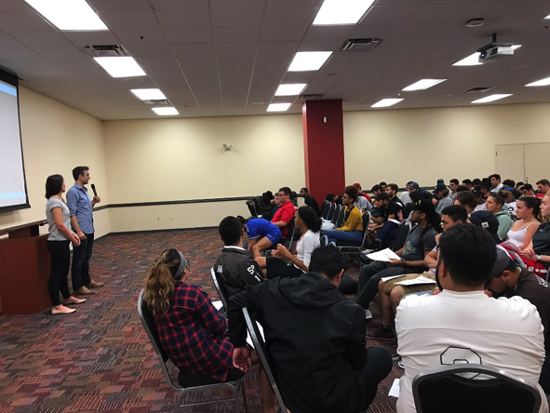 The Career Development Center invited the pair to meet with Barry University students on Nov. 2 to screen the movie and conduct a workshop to help students understand the importance of finding their passion and pursuing it for a satisfying life. Participating students enjoyed the movie and engaged in a disscussion, where they shared their aspirations with the group and came up with strategies to discover, explore and live their calling. One of the best ways to prepare for a job search is to participate in a mock interview. The Career Development Center offers practice interviews tailored to students’ individual occupational area and industry. Participating in a mock interview helps students hone their interviewing skills and increase their confidence in their ability to give strong interview performances. The Career Development Center and the School of Social Work collaborated to organize a mock interview day on Oct. 26 for students who wanted to gain real-life interview experience. Miami VA Healthcare, Chrysalis Health, Henderson Behavioral Health and the Center for Family and Child Enrichment visited the campus to conduct mock interviews and to give constructive feedback to help students develop their interview skills. Prior to the interviews, there was a networking session for students to talk with employers about opportunities and career suggestions. The employers were happy to meet with competitive candidates and inform them about their organization and job opportunities. Students also provided positive feedback, stating that the mock interviews were helpful to strengthen their interview skills and to connect with employers they were considering working with in the future. ORI-300 Career Readiness classes hosted employers, including Geico, Enterprise, Bankers Life, Azulle, Mirabel Technologies Inc/Gulfstream Media and Miccosukee Resort & Gaming on Oct. 24 and 25 to provide mock interview sessions to students registered in the class. Each student had a 15-minute meeting with an experienced recruiter and practiced answering interview questions. At the end of the interview, students received constructive feedback from the experienced recruiters and learned how to deliver more successful interviews in the future. 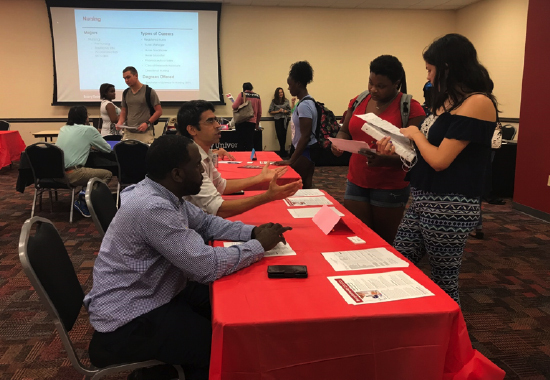 Over 30 graduate and professional school programs came to Barry University to discuss different program options and to recruit students. 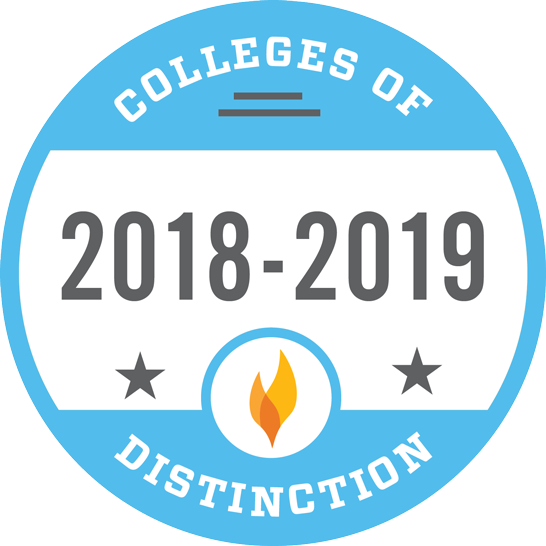 All of Barry University’s graduate programs were represented, in addition to local schools such as FIU and UM, as well as programs from across the country. Representatives spoke about the types of degrees and programs available, financial aid options and admissions requirements. 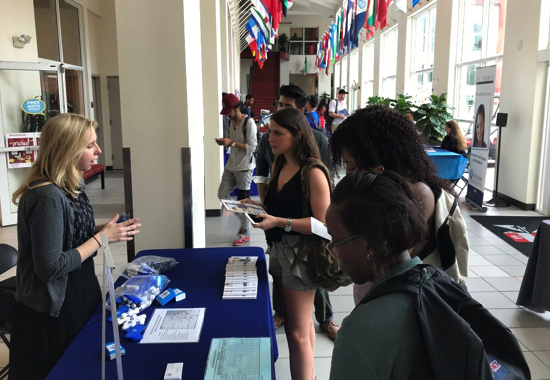 On Oct. 10, eight colleges and schools as well as various academic departments of Barry University participated in the Majors and Minors Fair to acquaint students with different majors and minors. Approximately 150 students participated in the event. Attending students left the fair with a deeper insight into the alternative academic programs at Barry University. With this newly gained knowledge, undecided students and students interested in supplementing their education with additional coursework will be able to make more informed decisions about their academic pursuits. Representatives were happy to have such a convenient setting to meet with a large number of students and disseminate information about their academic programs. 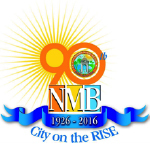 The Career Development started new partnerships with the City of North Miami Beach. North Miami Beach is primarily a residential and shopping community. The city provides a full range of municipal services, including public safety, water, sewer, storm water utilities, sanitation services, public works, parks and recreation facilities, public library, code compliance, planning and zoning, economic development, and general and administrative services. The Human Resources and Risk Management Department at the City of North Miami Beach is offering an internship opportunity, which reports directly to the director and deputy director of Human Resources and Risk Management. The intern will have the opportunity to learn about various human resources functions and processes within municipal government, while simultaneously upholding the RISE Service Standards for the residents of the City of North Miami Beach. The internship commitment will be 15-20 hours per week. Internship extension and additional hours are welcome. Interested students can view and apply for the internship at https://barry.joinhandshake.com/jobs/1147759. 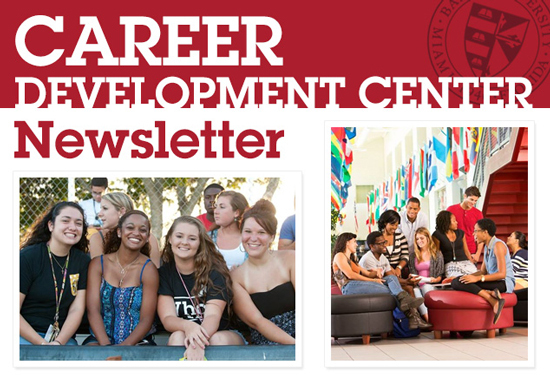 The Career Development Center’s electronic job database Handshake is widely used by employers that are interested in recruiting Barry University students. Research on employer expectations indicates that pre-graduation experiences such as internships are greatly appreciated by hiring managers. 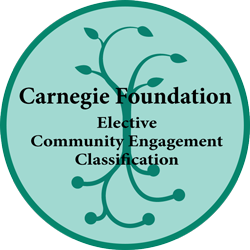 CDC recognizes the importance of career-related experience during college and strives to promote and facilitate internships for students. Step 5: Go to “Job” tab and start exploring full-time and part-time jobs, as well as internships.